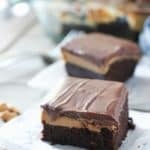 The Best Chocolate Peanut Butter Cake! – This easy to make incredibly delicious treat will become your favorite cake everrrrr! The peanut butter layer is just that…plain peanut butter slathered onto of delicious chocolate cake! I have been waiting for this cake my entire life…. period. Drop the mic. Walk away. Boom and Booyah! Chocolaty cake, smothered in peanut butter and topped with chocolate ganache frosting. I am speechless, (which could be from the peanut butter stuck to the roof of my mouth…I am a spoon licker). I used our easy one bowl Best Chocolate Cake recipe, topped it with peanut butter straight from the jar…which is how peanut butter is best. 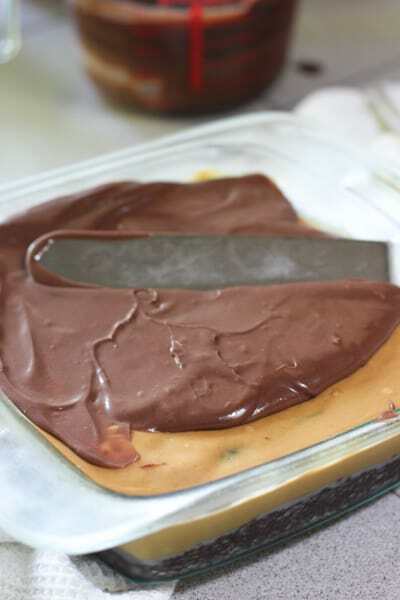 Then covered it with a two ingredient ganache that you make in your microwave in 2 minutes! Birds sang, the skies parted and there was cake! 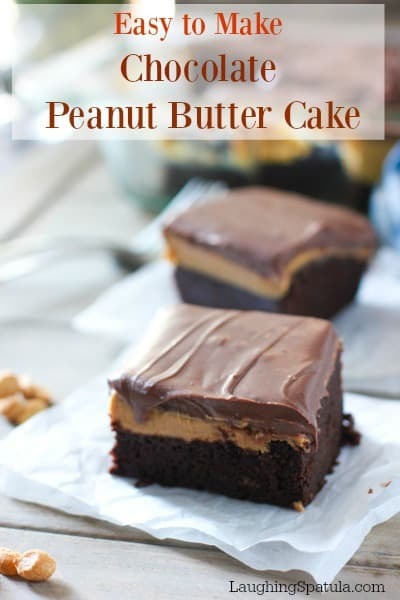 The Best Chocolate and Peanut Butter Cake ever! My favorite part of making this cake is spreading the peanut butter, right from the jar, onto the cooled cake! I make this for everyone I love….I just like to watch them eat it and smile through their chocolate and peanut butter coated teeth! Heaven! Chill in the fridge for a bit. Then top with this 5 minute microwave Chocolate Ganache! Slip this beauty back in the fridge for 30-60 minutes before slicing, and everybody is your friend! The cake and frosting are not overly sweet, which makes the peanut butter the star of the show. If you have a peanut butter lover in your life, this Peanut Butter Chocolate Cake will be their forever favorite! Have I mentioned how much I love this cake? I love this cake! NOTE: THERE ARE TWO RECIPE CARDS BELOW. 8 X 8 size for a small PB binge or a 9 x 13 for when a small cake just won’t do! To the best cake in the world! I’m worried about the peanut butter hardening enough. I used normal Jif Creamy peanut butter and put it on about 10 min after the cake came out as the recipe suggests. How long does it usually take to harden? Hi Ella – the peanut butter won’t ‘harden’. It will firm up in the fridge. The ganache will keep it in place. Chill good after the ganache is poured on before slicing! Any tips on dyeing the chocolate ganache red and black? I’m trying to turn it into a ladybug design for my daughters birthday. I have little experience with food dye. You can use dark chocolate for a blacker ganache. But red? Don’t think you can turn chocolate red :). Maybe use a piping tool with red frosting and do an outline of a lady bug? My husband was raving about a chocolate peanut butter cake that his grandma makes and was wanting to make one for our soon to be 5 year old daughter. I was looking online and found this recipe which appeals to me more than his grandmothers. Yours sounds absolutely devine!! But since this is for children, how much caffeine do you think the coffee is adding per serving? Chocolate in itself has caffeine in it so I’m not expecting caffeine free but some parents are super picky about the caffeine intake for their children. If it was just my child I wouldn’t care! Hi Jen – 1/2 cup of coffee divided by 8 servings, can’t be much. You can probably fine some info on exact mg’s on the google somewhere :). Substitute 1/2 cup off decaf or water for the coffee if it’s a big concern. The peanut butter is the star of the show for this cake! I was looking on line for a receipe like this, to make a cake for a friend’s birthday. She just lost her husband of 18 years 2 weeks ago, her birthday is next Thursday. She needs a pick me up and I know she loves chocolate and peanut butter. This is the perfect cake for her. I lost my husband 4 years ago myself and know how hard the first year especially is. Plus she has two son’s who lost their dad. Thank you for this, I am sure she will love it. You are a good friend Debbie! Hugs to you both…hoping cake lifts her spirits. xoxoxo! This was one of the most delicious cakes I’ve made in a long while. Last night I had a hankerin’ for chocolate and peanut butter. Now I’m not a fan of being in the kitchen so I rarely bake or cook. I did a search for chocolate and peanut butter cake and your link read the best, I had all the ingredients except for the cream which I ran out to get in the midst of a snowstorm. I get all the ingredients measured out and ready, subbing white granulated sugar for raw sugar, vegetable oil for coconut oil, and organic peanut butter for regular processed peanut butter. Followed the instructions. After 25 minutes of being in the oven I test the cake in the center with a toothpick and it came out very wet. So I add another 10 minutes. It should have been 5 as the cake came out a tad dry. so next time I will be a bit more cautious with baking time. I cooled off the ganache in the freezer while my I hoped my loose organic peanut butter would Harden somewhat in the fridge but it didn’t. 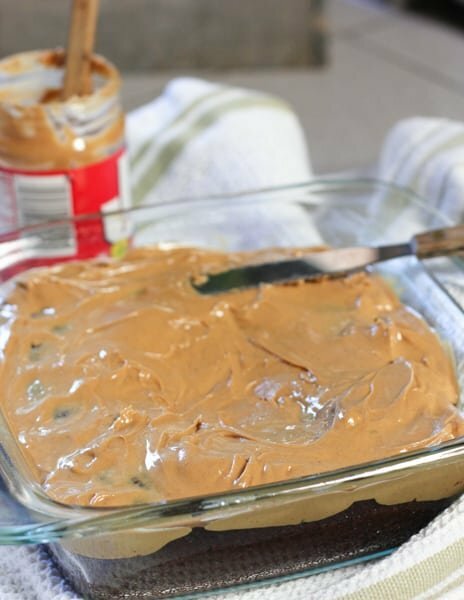 There’s a bit too much oil in that type of peanut butter but the following day most of the oils had seeped into the cake so that was a plus in disguise. This cake actually tasted better the following day. Anyho, I will definitely make it again, and next time I will add some espresso powder to the ganache to give it a little more pop. Not that it needed it in the least, I just LOVE coffee! Holy compliment! Thanks so much, Desi! I love the modifications you made and I’m so happy you enjoyed! Cheers! Hi there– in the ganache recipe you list vanilla twice– how many teaspoons does this frosting call for? Thanks! H Andrea! My apologies! I moved to a new recipe card system and some of them got mixed up. I have fixed it…please take a look and let me know if you have any other questions! 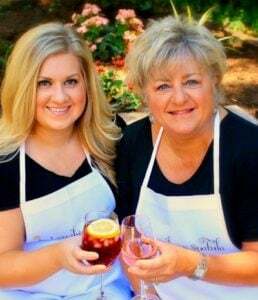 Thanks so much for the note, we are working our way all 350 recipes to make sure there are no more errors. Thank you so much, Kathi! I figured it out by reading the directions. I made this todaybfor my husband’s birthday— and it was delicious! I used canola oil as it’s what I had, chunky peanut butter (because it’s his favorite) and ended up not using all of the ganache. Thanks again! I made this 2 ways- as written, and the other I made a pb buttercream in place of straight pb. These cakes are amaaaaaaazing!!! I was skeptical of the coffee/sour cream in the cake, especially with no butter but this is delicious. Using the buttercream instead of straight pb was my favorite. Thank you Cassandra! totally thrilled you loved it as much as I do and the buttercream sounds delicious! Made this tonight- used a dark pan and found it was done at 30 minutes. I also used crunchy natural peanut butter and not all of the ganache frosting. Was amazing! My husband said it was the best cake I’ve ever made and I bake a lot! Served it with chocolate peanut butter ice cream- really good! I am so glad you loved it! I can’t keep it in the house because we can’t stop eating it…but every special occasion and I whip this up! Thank you for taking the time to send such a nice note! I really want to make this but my husband wouldn’t like thw coffee. What could I substitute? My first thought is milk or just water? Thanks! Hi Kelly! You truly can not taste the coffee. It simply enhances the flavor of the chocolate. But if you really need to pass on it, just sub 1/2 cup water. Shouldn’t affect the taste too much. The peanut butter is the star of the show! :).